Sebago Lake is nestled in Southern Maine and the home of wildlife, natives and tourists. Known to locals and regulars as “THE lake”, it is the second largest lake in the state of Maine and the deepest lake in New England holding almost a trillion gallons of crystal clear water. According to the Portland Water District, the water is so exceptionally clean that it’s exempt from expensive filtration equipment to convert it to drinking water. Now that’s clean. 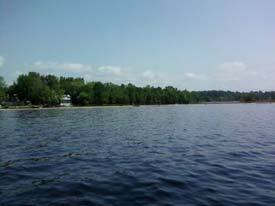 With its clean water and natural surroundings, Sebago Lake is a popular tourist attraction. With so much to do and enjoy, you are sure to find exactly what you need on your vacation in the Sebago Lake area. Visit Sebago Lake is your online source to planning your vacation. From finding the perfect place to stay all the way to launching your boat or finding things to do. it’s all right here. Hotels, Motels and Resorts – Find hotels, motels and resorts to stay around the lake. Cabins and Cottages – Want to rent your own Cabin or Cottage? You’ll find the perfect place here. Campgrounds – Enjoy the true beauty of the lake and stay outside at the many campgrounds around the lake. Looking for something to do? Check out our Things to Do page. And remember, we’ll see you at THE LAKE!